You may need some carpet repair, Albuquerque, because people live on their carpets- and it shows! Even the most careful ones will find their carpets bumpy, ripped, stained, or in some other state of disrepair, and may need carpet repair in Albuquerque for retaining its looks. Sadly, if not repaired, all these carpet problems detract the room’s appearance and may lead to multiple issues that may necessitate early and expensive replacement. When carpets start looking bad, many people prefer calling carpet contractor, whether it’s a repair person, or a cleaner. However, in most of the cases it’s better to hire carpet repair professional for the job. Carpet repair expert can handle wide range of issues that traditional cleaners cannot resolve and they are best solution for homeowners with serious carpet issues. Carpet cleaners can do what they are expert at. They clean carpets and can get the embedded food, dirt, or Kool-Aid stains out from the carpet. If you are interested in just a superficial treatment to bring back your carpet to an attractive status, then they’d be perfect for the job. However, you must understand the limited of carpet cleaning. 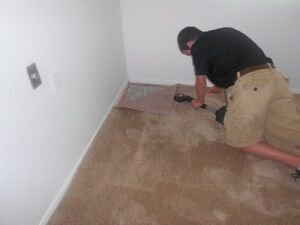 Even the best cleaner on the market won’t be able to fix your poorly stretched carpet that has begin to look “loose”. Cleaners can removed stains, but things they cannot sole will remain right there on the carpets. If your carpets are physically damaged, a cleaner cannot do much for you. A carpet repair service can re-stretch your carpet, which will give you a brand-new look. They will also fix all errors in its initial installation. They will also hide and repair its seams. If there is some stubborn stain or a place that cannot be removed by a cleaner, they will actually remove the problem area, and replace it with a similar piece-without any visible signs of swap! If you closely look at your flooring, you will find many stains and blotches. You will find that they are not responsive to simple cleaning. In that case, you have few options. You can either hire a cleaner, or live with a still damaged, and worn out carpet, or can get in touch with a carpet repair Albuquerque service whose specialists ca fix the problems. Our carpets have a amazing influence on the décor of our homes. A poorly installed or damaged carpet will detract attention from your home’s aesthetic appeal. Cleaning won’t do much. So, Xtreme Clean’s carpet repair service offers you a powerful and affordable way to extend the life of your carpet while increasing the beauty of your house when you need some carpet repair, Albuquerque!